At last! We've got the details lined up and are ready to take registrations. Many thanks to our fieldtrip leaders for creating a lineup of visits to interesting sites in the Sacramento Valley / Bay Delta region. Wetland restoration has been in progress in San Francisco Bay since the 1970s. Restoration practices have evolved as lessons have been learned from each successive wave of restoration projects. Early restorations were largely unplanned and resulted in habitats of widely varying quality. As the understanding of the relationships between tidal processes, sedimentation, and marsh ecology improved, a second wave of restoration projects were designed and implemented in the 1980s and 1990s. These projects provided consistently higher quality wetlands habitats while offering new lessons to further refine the restoration practice. Now a third wave of projects has been constructed that incorporate science-led design and adaptive management. 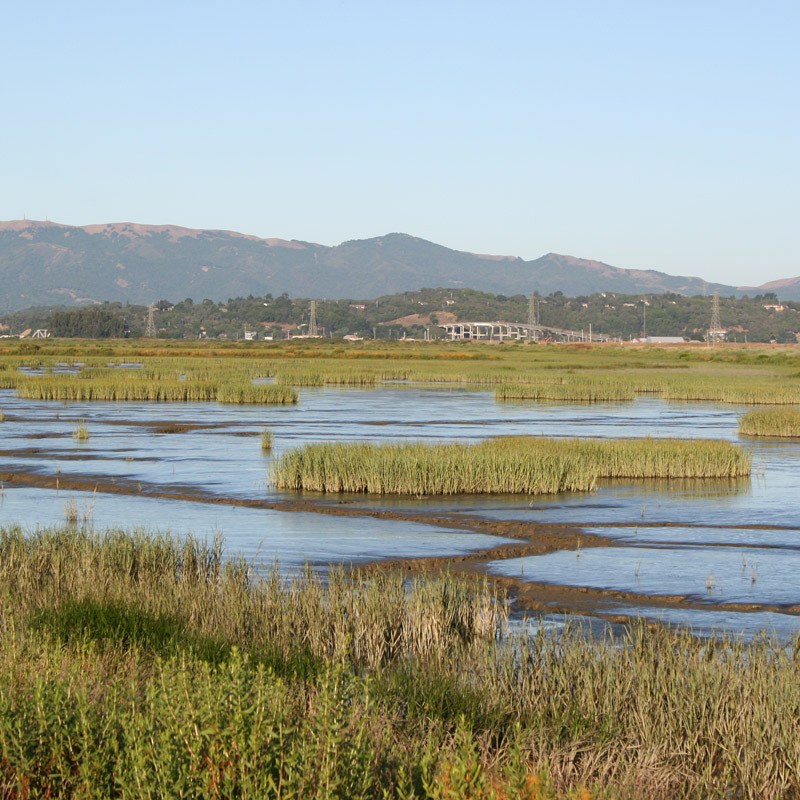 This field trip will visit a number of tidal wetlands along the northern shores of San Francisco Bay to highlight current design practices based on the lessons learned from earlier projects and to explore new questions for future projects. What to bring and be prepared for: Bring lunch and water, sunscreen/hat. Wear good walking shoes and dress in layers. This is a full-day fieldtrip. A map, directions, and (if needed) signup sheet for carpooling will be provided at or before the conference. A half-day fieldtrip led by Wildlands staff. This is a unique opportunity to visit a U.S. Army Corps of Engineers 404 wetland mitigation bank, a U.S. Fish and Wildlife Service species conservation bank, a National Marine Fisheries Service approved salmon conservation bank, and California Department of Fish and Wildlife approved farm-friendly raptor preserves at the Wildlands River Ranch Mitigation Complex. River Ranch is located approximately 40 minutes from UC Davis and will give visitors a comprehensive look at mitigation and conservation banking in Northern California. The tour will include three separate site visits; first of the wetland mitigation bank, then on to the National Oceanic and Atmospheric Administration salmon bank and USFWS conservation bank at the northern portion of the Ranch. Attendees will take a hay ride from site to site, and Wildlands staff will be stationed at each bank to answer questions and provide insight into banking on the ground in the Sacramento Valley. What to bring and be prepared for: Please wear shoes acceptable for wet/muddy terrain. This tour is completely outdoors with little shade on much of the tour. Please wear appropriate layers for the day’s forecast, and hats are be suggested. Water will be provided onsite. The fieldtrip begins at 8:30am. Depending on weather & ground conditions, the tour will extend no later than 11:30am. Parking is limited; a signup sheet for carpooling will be available at the conference. Vehicles should park at the north end of the Ranch — a map and directions will be provided at the conference. Please note that it has been a season of heavy rain and tour details, such as the hay ride, are subject to ground conditions. A half-day fieldtrip led by Westervelt staff. As of mid-April, Lake Comanche is at 69% capacity and releasing 3900 cfs. Part of the Mokelumne River is still flowing across New Hope Road (our access road) and through our front gate. This condition will remain unchanged until Comanche reservoir stops releasing water to make room for snow melt. We can still get onto the Cosumnes Bank but it does mean driving through 8 inches of water to get to our gate on Grizzly Slough. We will have to play it by ear, but it is a really good lesson in restoration planning in the floodplain because our project was designed to accommodate an upstream breach just like what happened. Tour begins at the south end of the property with an overview of the project and its history that lasts about 30 min w/Q&A. Then we will load into vehicles or a hay ride and do a driving tour along the Mokelumne River, stopping at several sites to look at preserved valley oak forest, planted native grass and woody riparian restoration sites, natural process restoration sites, then out to our levee breach. What to bring and be prepared for: Sturdy shoes, hat, long-sleeve shirt and pants (mosquitoes), mosquito repellent (we will also supply some for everyone's use). Bring binoculars if you are interested in doing some birding. The fieldtrip begins at 8:00am on the south end of the property. Depending on weather & ground conditions, the tour will extend no later than 11:00am. Parking is limited; a signup sheet for carpooling will be available at the conference. A map and directions will be provided at the conference. A half-day fieldtrip led by Peter Buck, SAFCA, and Vance Howard and Steve Chainey, GEI Consultants. This field tour will consist of several stops to visit restoration and mitigation projects associated with flood control projects implemented by the US Army Corps of Engineers and the Sacramento Area Flood Control Agency (SAFCA). The tour will begin with two stops in the Natomas Basin, where participants will visit riparian woodland, native grassland, and managed freshwater marsh habitats that were planted 5+ years ago. Participants will learn about SAFCA’s comprehensive approach to on-site project mitigation, as well as important lessons about successful design, construction, planting, and maintenance of large-scale mitigation sites. The tour will then travel to the banks of the Sacramento River to visit a well established erosion repair project site where participants will see first-hand the successful features of the project, as well as the challenges of human use at the site. The final stop will be on the American River to visit an aquatic and riparian habitat restoration project currently under construction, which involves laying back an eroding bank to restore floodplain habitat. What to bring and be prepared for: Water, sack lunch, hat, sunscreen, and sturdy shoes. Bring binoculars if you are interested in doing some birding. Participants will meet at 8:00am at the Archery Range in Discovery Park in Sacramento. Carpooling will be an option from this location, with departure time at 8:15 a.m. We will return to Discovery Park, which is the final tour stop, by noon. For those who have time, we will walk over and visit the American River restoration site until 1:00pm. Participants will be welcome to eat their lunch on the banks of the American River at the restoration site. A map and directions will be provided at the conference.